Would you like to take part in the war and protect your territory? Then this game is for you! Just control your tank and shoot. You must kill all the enemies as soon as possible, otherwise, they will destroy your buildings. Have much fun here. This is a real war! And here you will have to battle your way through an intense top down view tank shooter with epic boss fights. 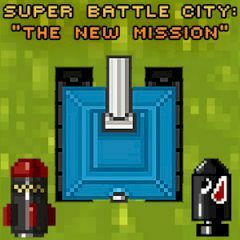 That is why, as you can see your mission in Super Battle City is to drive your armored vehicle to requested destinations to eliminate several targets as you try to avoid enemy attacks. Just try to reach achievements, break the high score and upgrade your tank and weapons in order to cause the maximum destruction. Everything depends on you, so just throw all the problems away and set the best record.